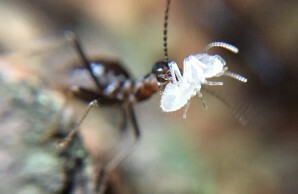 Termites are often maligned for chewing up buildings in tropical climates, but their eating habits are also important in decomposition of leaf litter and nutrient cycling. A study in Borneo, using a novel experimental approach, discovered that teams of tiny termites increase drought-resilience of tropical rain forests. Louise Ashton of the University of Hong Kong, Hannah Griffiths and Katie Parr of the University of Liverpool, Paul Eggleton from the Natural History Museum in London, and six other globally-dispersed colleagues conducted a study of termites in lowland tropical rain forest in the Maliau Basin Conservation Area of Sabah, Malaysia. The researchers used thousands of toilet paper rolls impregnated with a termite-specific insecticide to remove termites from four quarter-hectare-sized experimental plots. Four additional control plots were left unaltered. Termite abundance was then observed every two months, before and after the El Niño drought of 2015-2016. The researchers also measured leaf litter decomposition rates and monitored the survival of tree seedlings in the control and experimental plots. In the untreated plots, termite activity and abundance increased during the drought year, with more than twice as many termites during drought than after. This resulted in control sites with greater leaf decomposition rates and soil moisture, compared with termite-removed experimental sites. Termites also created hotspots of soil nutrients, and survival of experimentally planted tree seedlings was higher at sites with more termites. The positive effects of termites were specific to times of drought, when termites appeared to mitigate against moisture loss. No differences in leaf decomposition, soil moisture, or seedling survival were found in the post-drought period. The specific mechanisms by which termites thrive in drought remain unknown. The researchers speculate that termite subterranean construction may be easier in drier, less water-logged soil. Termites create their own microclimate by bringing water up through the soil, creating “sheeting”—temporary aboveground structures that protect against desiccation.